TLC Ingredients' relationships with its suppliers enable it to help its customers meet consumer demands. For most food companies, balancing taste and flavor with growing consumer demand for healthy food options can be a delicate balancing act. The company partners with food product manufacturers to help them formulate products that appeal to customers. TLC’s food industry customers include meat processors, dairy manufacturers, beverage companies, processed food suppliers, seasoning and flavoring companies and tortilla and bakery manufacturers. 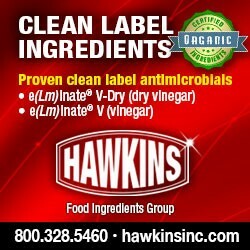 TLC also works closely with ingredient suppliers such as ADM, Hawkins, Ivanhoe, ICL Performance Products, Prayon Corp. and Ingredients Solutions (ISI). Suppliers help the company keep up on industry developments and share knowledge about the products they provide. “Our job is to be knowledgeable enough about all of the hundreds of products that we handle, so that we can bring in our suppliers to provide technical solutions to our customers,” Turriff says. In addition to food ingredients, the company distributes industrial chemicals and phenolic resins to customers in the cleaning and personal care product industries as well as the chemical manufacturing sector. Turriff co-founded the company in 2001 with Peter Lorusso and Jim Cavelle. Although the company believes in “tender loving care” when it comes to its products and customers, TLC’s name is also derived from the first initials of its founders’ last names. Turriff, Lorusso and Cavelle previously worked for a food and industrial chemical distributor owned by Turriff’s family before starting their own company. The three partners brought together more than 75 years of industry experience when they started the company 15 years ago. TLC Ingredients is committed to the cornerstones of Food Safety and Responsible Distribution across all of its operations. “If we are not handling products safely and in a way that protects the environment, we are not doing our job and don’t deserve to be in business,” Turriff says. The company’s facility has clearly-defined and segregated areas for food ingredients. TLC maintains high levels of food safety and sanitation across its operations, evidenced by its recent attainment of Global Food Safety Initiative (GFSI) certification. “That [certification] is not a one-and-done thing,” he adds, noting the company continues to rework its food safety procedures. TLC’s Responsible Distribution and Food safety programs are based heavily on programs established by the National Association of Chemical Distributors (NACD), of which it is a long-time member. TLC is a long-standing member of the national association of chemical distributors (NACD). TLC strictly follows the association’s Code of Management Practice, which includes best practices governing 13 areas including handling and storage, security, job procedures and training, corrective and preventive actions and community outreach. The NACD’s Responsible Distribution programs include regular third-party audits. “Compliance with responsible distribution helps us earn our right to operate. [The codes] are where an important part of our earning our right to operate comes from,” Turriff says. Turriff currently serves as the NACD’s Central Region President, and is also active on the organization’s education committee. Turriff and other TLC personnel are actively involved in the NACD-sponsored “You Be The Chemist” competition for students in fifth through eighth grades. The program, created by the Chemical Educational Foundation, is a quiz show-like competition that engages and educates students in chemistry, he notes. In addition to his involvement in the NACD, Turriff is also a member and former president of the Chicago Drug and Chemical Association. Also critical to TLC’s success is membership in the Institute of Food Technologists (IFT), which helps them stay informed of changing food industry trends.